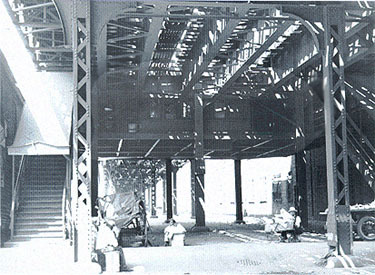 In 1907, as part of an ordinance to allow the South Side Line to install a third track for express service, all stations north of 43rd Street, including this one, were required to replace their grade-level facilities with mezzanine-level stations, clearing the alley way beneath the tracks. Because the tracks' original elevation was not built with the height clearance of mezzanine-level stations in mind, the portions of the trestle at station locations had to be slightly raised, creating roller coaster-like humps in the structure. The occasional rise and descend can still be seen in the South Side Green Line's tracks. In December 1993, while the CTA was considering various plans for the Green Line renovation, one was to close stations at 35th, Indiana and others, but open a new one at 31st Street. This never came to pass.